I’m just going to warn everyone upfront that this will not be a particularly unbiased review. I adore Kor Spiritdancer, and I adore the totem armor mechanic that debuted alongside her in Rise of the Eldrazi. Then they also added Back to Nature to Standard for the entire time she was around, along with a bunch of sacrifice effects like the Eldrazi annihilator keyword, plus the Phyrexians and their infect ability. Well, she is a superstar in casual play, and goes particularly well with most any kind of aura you can think of, from Wild Growth effects through removal spells like Recumbent Bliss, not to mention her perhaps most obvious and most fun application: sticking a bunch of Umbras on something and stomping over people. Memo to R&D: If she’s not in the core set for the next time we visit Theros, you and I are going to have a problem. 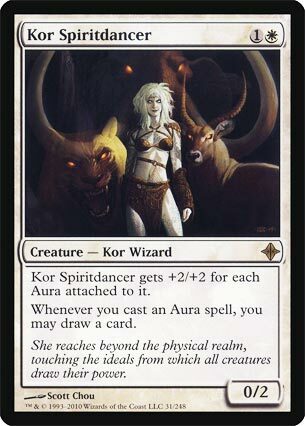 Kor Spiritdancer isn’t a casual card, but she’s the kind of creature that shines in decks like that. It gives your Aura spells a bit of reach, and she pairs well with other Auras. Imagine her with a Rancor: a 4/4 with trample that drew you a card in the process. The Spiritdancer has a spot in some of the Bant Aura decks that revolve around the Slippery Bogle win condition (put Aura on Bogle = profit), and being able to draw into more Auras is nice. She’s a good glue card in a fragile combo deck, and while it’s not easy to make her work, the payoff is quite rewarding all the same.